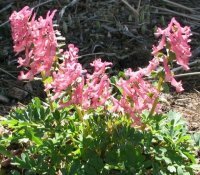 Corydalis root is a low growing plant with narrow leaves and pink flowers that is native to China, Japan and Siberia. A relative of the opium poppy, is stores energy over the winter in a yellow tuber or root. Corydalis root has a tranquilizing effect good for anxiey, insomnia and restless leg syndrome (RLS). The root in dug up in the autumn, dried, sliced and used in herbal medicine. Many times, herbalists will combine this with California poppy to treat the symptoms of anxiety, agitation and nervousness. If used for RLS, it may calm the sensation of crawling in the legs, which usually occurs at night. RLS starts in the legs, but eventually, if not treated will progress to the arms and then the trunk. Anxiety, insomnia and restless leg syndrome. Sedative qualities of the alkaloids increase the effects of barbituates, treat anxiety, and are about 40% as effective as morphine for inducing sleep. Cataracts. Alcohol extracts of corydalis slow cataract formation in diabetics. Never take this herb or the tuber during pregnancy. For that matter, never take any herbs in pregnancy unless cleared by your doctor. Continuous use may result in increased tolerance and therefore, decreased effectiveness. Cross tolerance to morphine may also develope. Do not combine this herbal supplement with any sleeping medication such as Ambien, Lunesta or amitriptyline. This goes for OTC sleeping aids also! Additive effect of sedation can lead to slowing of respirations. For treatment of cataracts, corydalis root should be used only under professional supervision. Please discuss with an eye doctor. Read about more herbs at the Herb Dictionary Online. Subscribe to Herbal Hints our monthly ezine. You will receive free tips on how to use different herbs, new recipes and learn about the "Herb Of The Month".